Foreclosure filings rose in August as lenders in several states continued to work through a backlog of delinquencies and defaults, according to an industry group's report Thursday. Foreclosure notices -- including default notices, scheduled auctions and bank repossessions -- were filed on 193,508 properties during the month, an increase of 1% compared with July, according to RealtyTrac, which markets foreclosed properties. But filings were still 15% lower than the year-earlier period. "Bucking the national trend, deferred foreclosure activity boiled over in several states in August," said RealtyTrac vice president Daren Blomquist. The foreclosure hot spots have been shifting. Filings are rising in "judicial states" such as New Jersey, New York and Maryland, where the foreclosure process goes through the courts, and falling in "non-judicial states" such as California, Arizona, Nevada and the District of Columbia, where they're handled by a trustee, usually a title company. 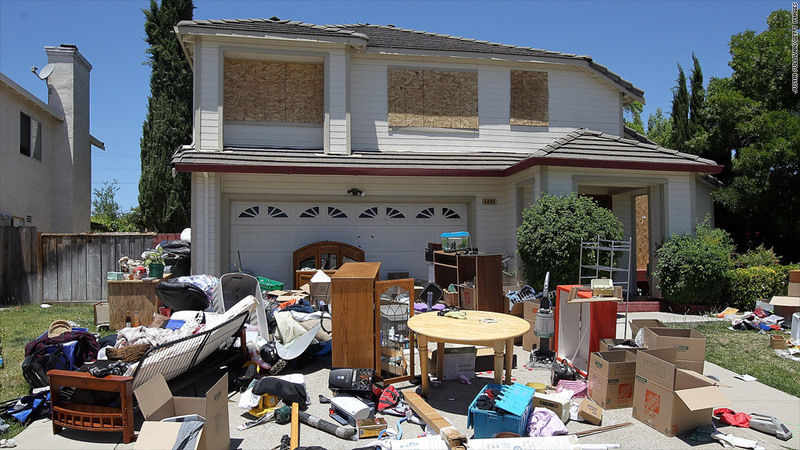 The flood of foreclosures now coursing through the judicial states has swelled in the aftermath of the $25 billion foreclosure abuse settlement, signed off on this past April, that laid out a clear path of conduct for lenders when pursuing foreclosures. That caused many banks to push more cases though the foreclosure pipeline. The judicial state of Illinois, where foreclosures were up 42% year over year, and Florida, where there was a 16% annual increase in August, respectively, now claim the two highest foreclosure rates. They dethroned states such as Arizona, California, Georgia and Nevada, according to RealtyTrac. In Illinois, one in every 298 properties has been hit with a foreclosure filing reported. Central California cities dominated the list of metro areas with the highest foreclosure rates led by Modesto, Merced and Bakersfield. Chicago, in eighth place, was the worst hit metro area outside of California and the largest one in the top 20. Other major cities represented were Miami, at number 10, Phoenix at 18 and Atlanta at 19. One silver lining of the report was that actual bank repossessions -- the end game for the foreclosure process when mortgage borrowers lose their homes -- fell 2% month over month and 19% compared with August 2011, marking the 22nd consecutive month of year-over-year declines. Blomquist said he expected to see an increase in repossessions given the surge in foreclosure starts that occurred at this time last year. The average time between a foreclosure start and repossession is currently 378 days, he said. However, a number of measures have been put in place to help struggling homeowners hang on to their homes. The federal government and the banks have stepped up their efforts, offering to reduce mortgage payments through principal reductions and lowering mortgage rates. More than 5 million borrowers have received some kind of mortgage aid since April 2009, according to the U.S. Treasury Department. Home prices have also started to stabilize, and that has reduced the number of homeowners who are underwater, or owe more for their home than it is worth. CoreLogic reported Wednesday that the number of underwater borrowers declined to 10.8 million during the three months ended June 30 from 11.4 million in the first quarter. Having that home equity makes it easier for a borrower to keep a property. The report's other good news was that foreclosure starts fell 13% compared with August 2011 after three months of increases. There should be fewer bank repossessions this time next year.